The Benaud Trio is one of Australia’s finest chamber ensembles. 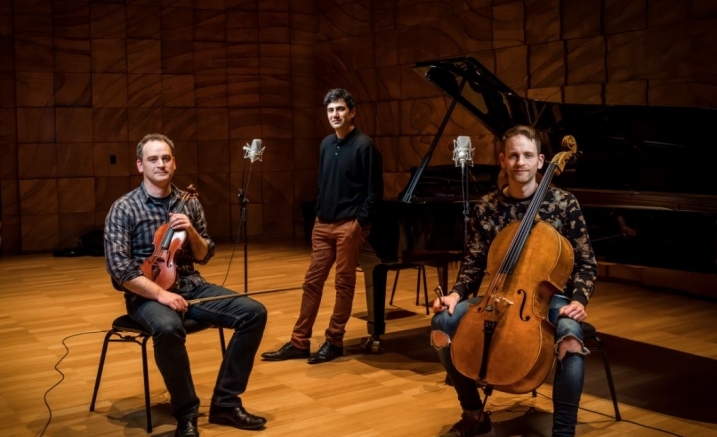 Formed in Melbourne in early 2005, pianist Amir Farid, violinist Lachlan Bramble and cellist Ewen Bramble have established themselves as formidable performers of the standard repertoire, works by Australian composers and music with a pop/jazz influence. Beethoven was a headstrong and proud revolutionary, his music bold and unrelenting. Yet revealed in his fifth piano trio is a warm and tender side of irresistible charm. Effortlessly sprouting the parlance of his classical forebears, Beethoven’s music is mellow and intimate, capped off with a sizzling gypsy finale. The Benauds also take this opportunity to introduce Adelaide based composer Jakub Jankowski to Melbourne audiences. His second piano trio reveals how innocence can survive despair and disarray. Please note, Benjamin Martin will replace Amir Farid on piano for this concert.